As a popular PC manufacturer, Acer also released Windows 10 drivers for many products after Windows 10 released. In their official site, Acer submitted a content page about Windows 10 upgrade. On this page, Acer lists laptops, tablets and desktops models that you can upgrade to Windows 10. Fortunately, from the list, we can find Acer supports many products for the Windows 10 such as Aspire series, Extensa Series, TravelMate Series, Iconia Series, etc. This will make your upgrading process more smooth as Acer provide the fully compatible drivers for the Windows 10 system. For downloading and updating Acer drivers for Windows 10, there are many ways you can choose. You can use automatically way, manually way, Windows driver updating way, etc. Here I will recommend two ways. I think this will be the best choice. Because you do not need to find drivers, download and update by yourself. All you need to do is clicking some buttons. Before you start this way, you need to download Driver Doctor first. Step 1: Click "Scan Now" button. The "Scan Now" button is in the center of Driver DR interface. This button function is scan driver issue. Step 2: Click "Get Drivers" button. After the scan finished, you will see the result. 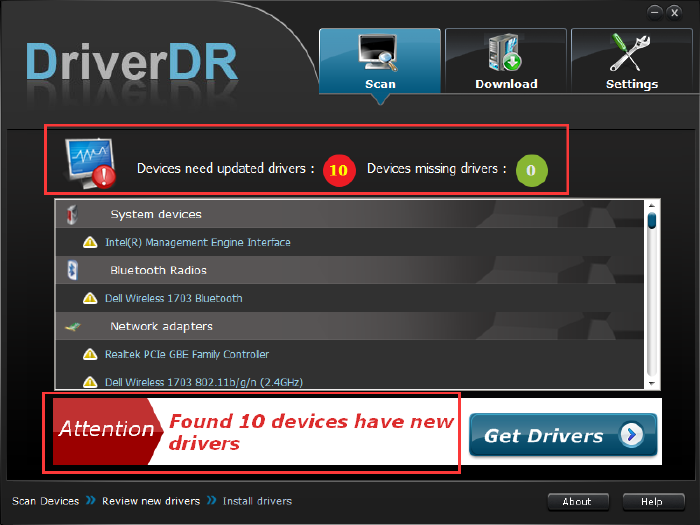 It will remind you something such as this: found 10 devices have new drivers. What you need to do is clicking the "Get Drivers" button. Step 3: Click "Download All" button. On this interface you will see all the drivers you want to update. So click the "Download All" button to download all drivers one time. This can make you do not need to find drivers and download drivers for many times. Step 4: Click "Install" button. After the download process finished, click "Install" button, it will automatically install the new driver version. So only 4 clicks you can update Acer drivers for Windows 10. 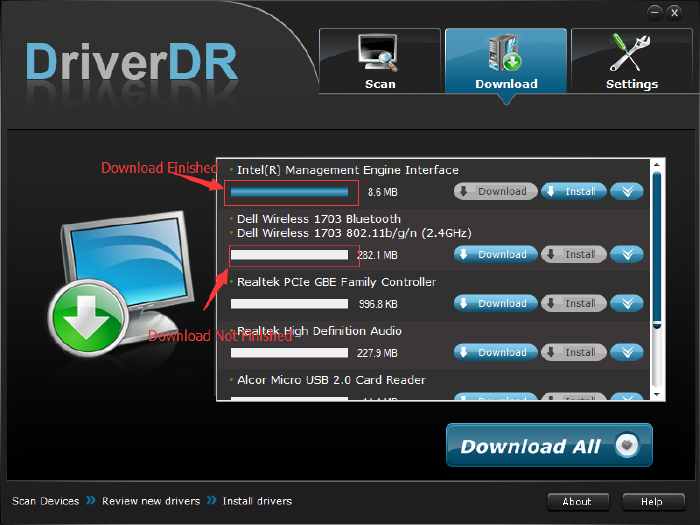 This is also the way that many people will choose because it need to download drivers from official site. Step 1: Enter Acer drivers and manuals download page. You can click this link directly enter: http://www.acer.com/ac/en/US/content/drivers, if you want to know how to find this link, try to use Google search and input "acer drivers download", it is so easy. And this page will provide three ways to find drivers. Step 2: Choose your computer model. If I use Acer Aspire V7-582PG laptop, type it in the product model, and then click "Search" button. Acer will automatically identify your system version, here it shows the system is Windows 10 64 bit, it is right. Step 3: Download Windows 10 version drivers. Choose the device drivers which you want to update such as the audio device, and then click the download link to start the downloading. After the download fully finished, click the driver package and follow the installation guideline to install it. So the two ways can help you keep Acer drivers for Windows 10 perfect.